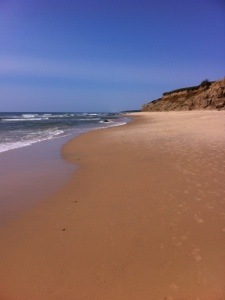 It’s not often enough that I can get away for sun, sand and seafood. I ought to live near the ocean; being landlocked, albeit near the beautiful Hudson River, doesn’t always cut it for me. 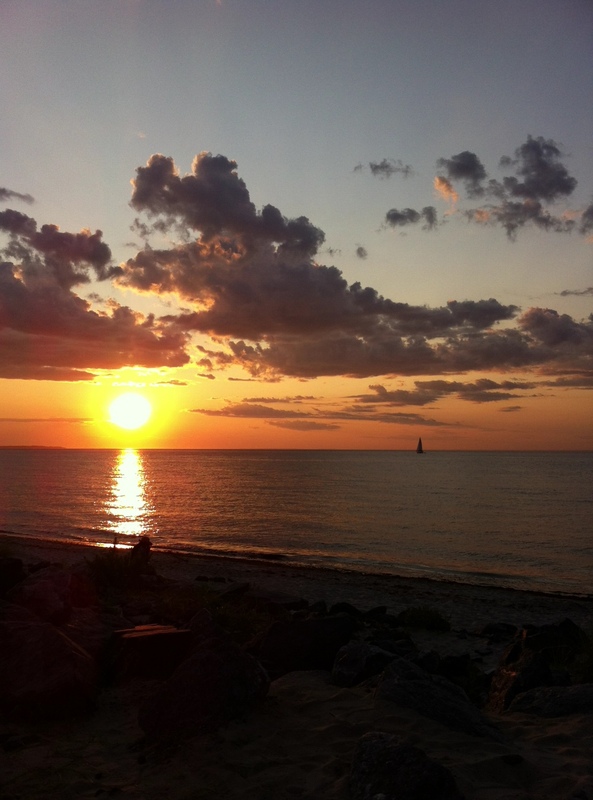 But thanks to a dear friend I got to go to a beautiful seaside spot last week, at the tip of Long Island’s South Fork, jutting out into the Atlantic. There I had a feast for all the senses: sunsets so hot and stunning they dazed my eyes, soothing waves crashing and gulls screaming softly, briny breezes in my nostrils, soft sand between my toes, exquisite food and drink, and most of all, good company. 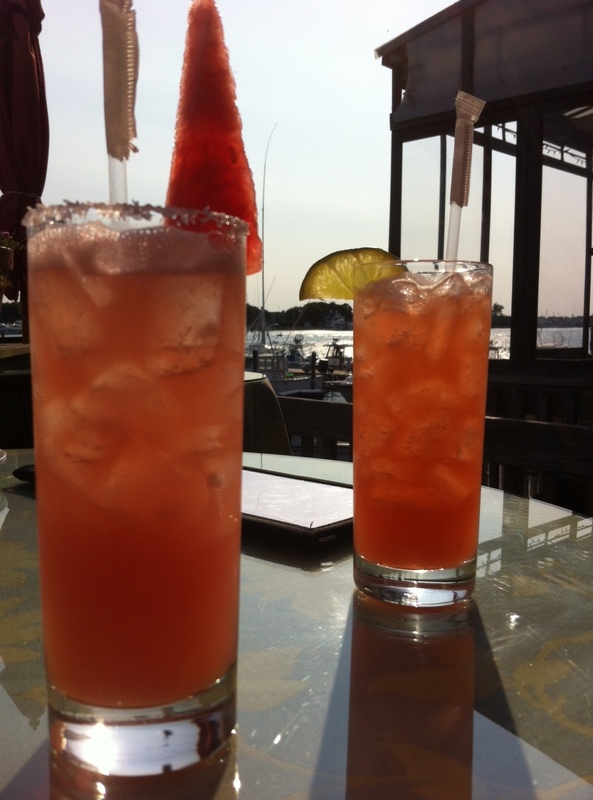 Fruity margaritas at FishBar, Montauk. I’ve been there a few times before, in spring, fall, and then last year, finally, in the summer, but this was the longest, sunniest trip, and glorious all around. A motel kitchenette for preparing oysters and littlenecks on the half shell and sauteed swordfish tidbits was the spot for the first feast, then another day it was off to FishBar for drinks, a watermelon margarita for me and a blood orange one for my companion. 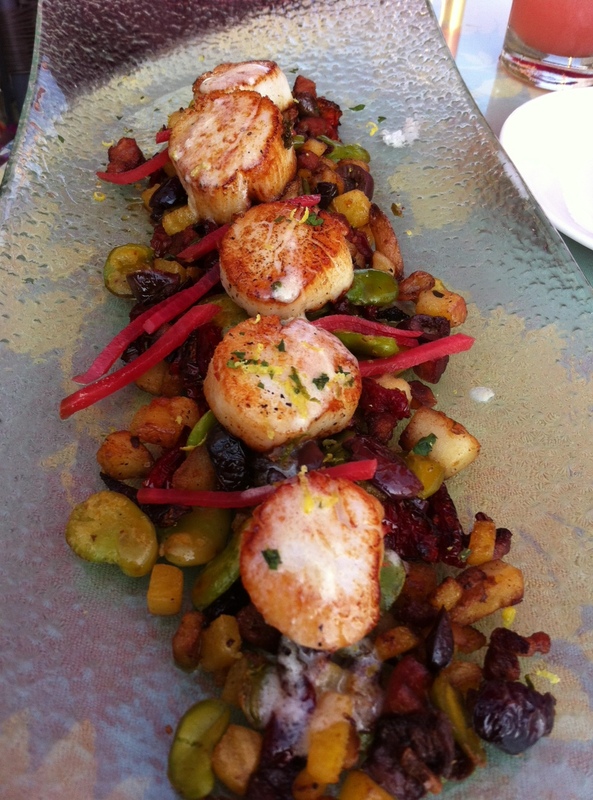 With bellies not yet full, we went for a glorious platter of fresh local sea scallops, pan seared and drizzled with lemon butter and fresh herbs, over a hash of chorizo, watermelon radish, crispy rainbow potatoes, kalamata olives, fava beans, house-dried tomatoes and yellow beets. On the last night we ate at Gosman’s Inlet Café, a perennial favorite for sushi and other good food and a beautiful view of the harbor, a constant stream of all manner of boats gliding to and fro. After a couple of good sushi rolls, we had a lush lobster roll studded with generous chunks of sweet lobster. Although under seasoned and not as good at the one we had at FishBar last year, it was satisfying and accompanied by quality coleslaw and fries. 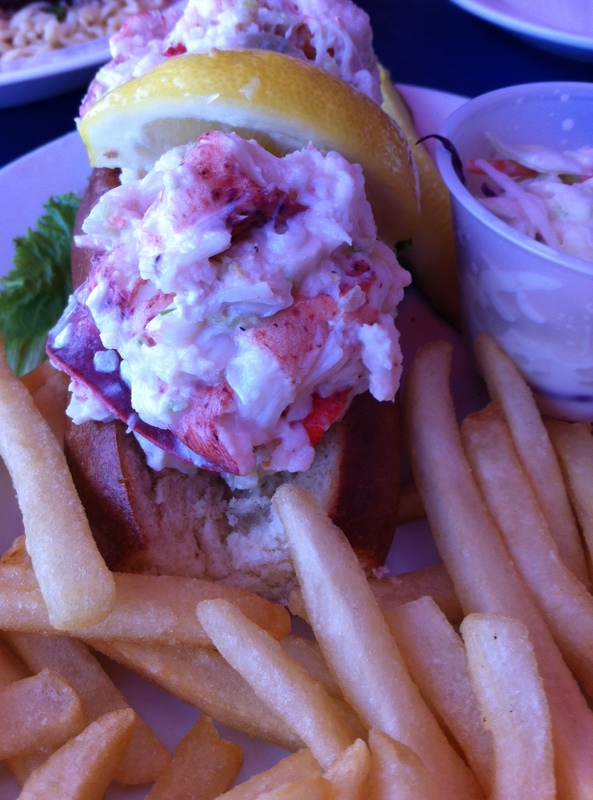 Lobster roll from Gosman’s Inlet Cafe. 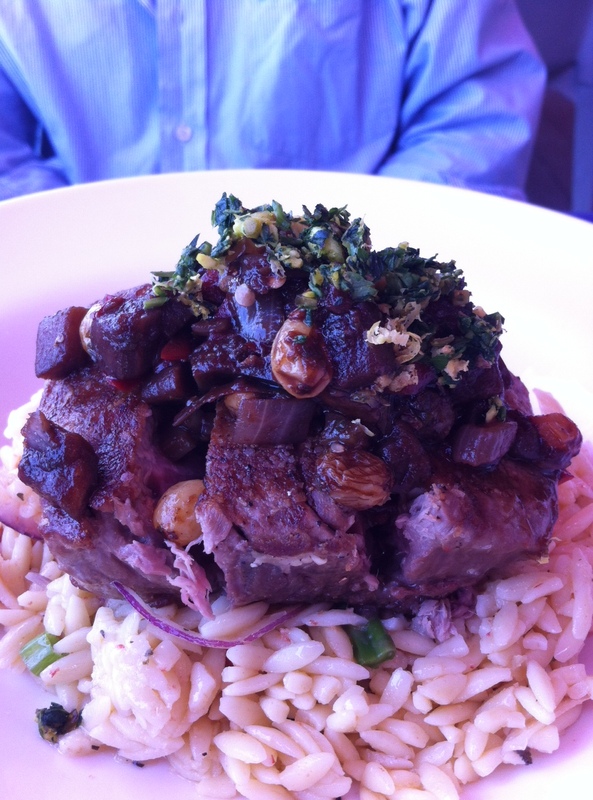 The grilled local yellowfin tuna topped with eggplant caponata on a bed of orzo was rich and flavorful. 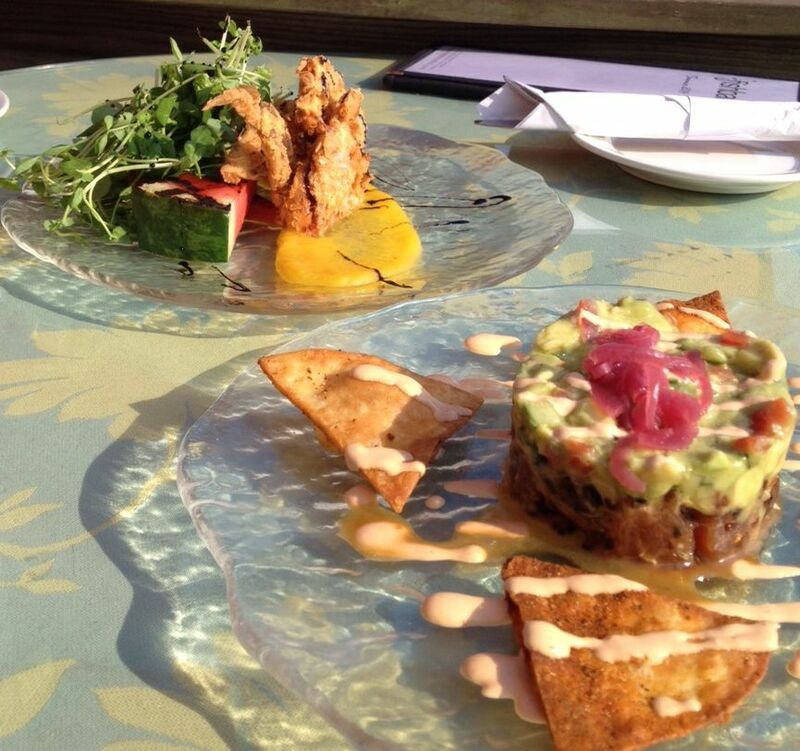 Local yellowfin tuna topped with caponata. Fried calamari with a variety of coatings: masa harina, flour, flour and grits. 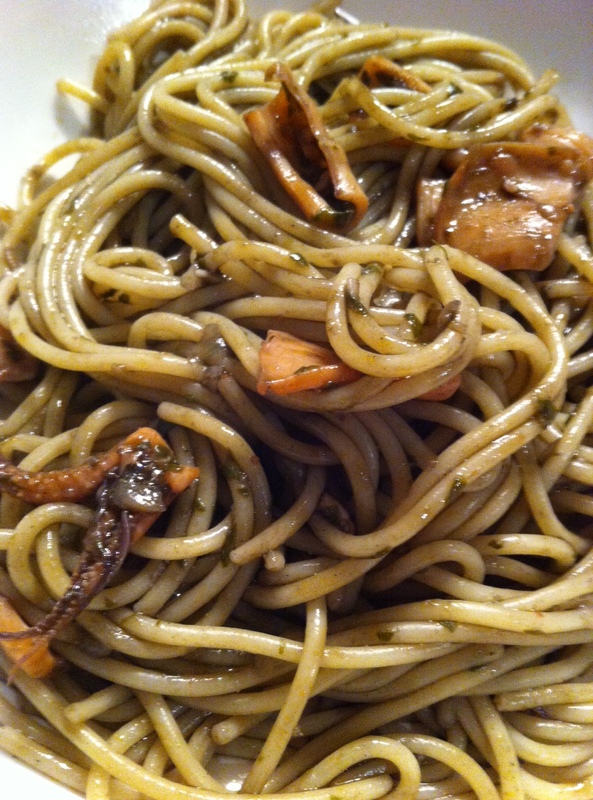 Spaghetti al nero delle seppie, a Sicilian dish. 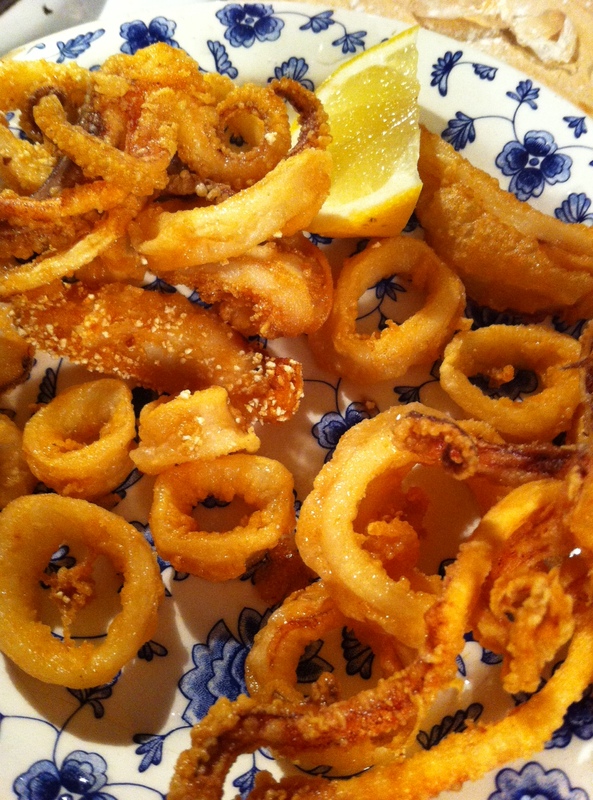 (testing recipes for my upcoming cephalopod cookery book). The squid was so impossibly fresh when I bought it four days ago that my leftover spaghetti neri for dinner tonight was still scrumptious. And I pan-roasted the tilefish with garlic and herbs. This fish, which I don’t believe I’d had before, lives on crabs, making its flesh sweet and succulent. 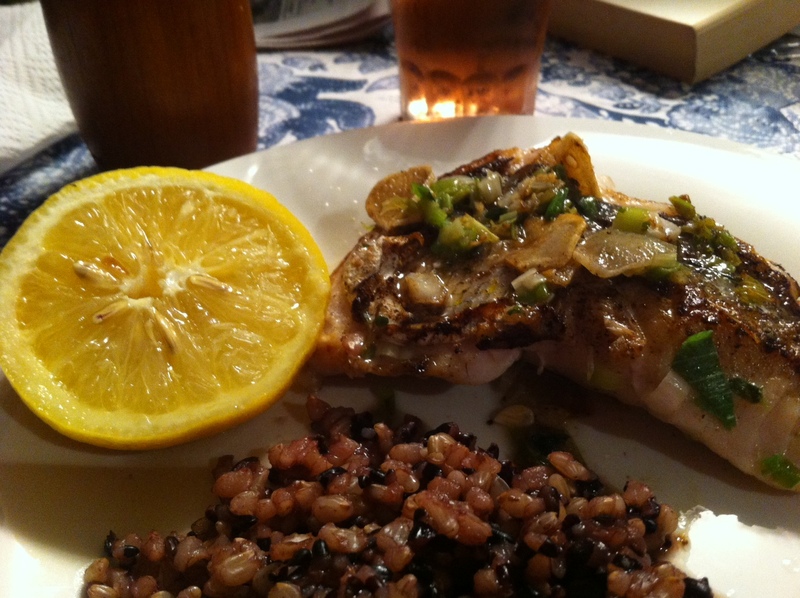 Pan-roasted tilefish with garlic and herbs.